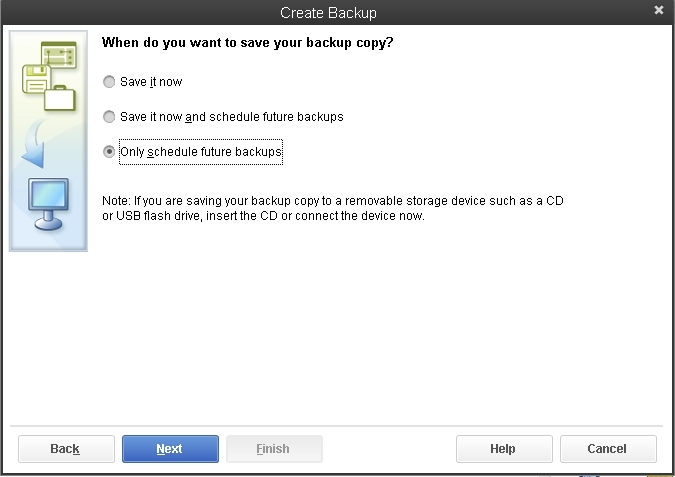 To schedule a backup, you may select “Only schedule future backups” radio button from the “When do you want to save your backup copy?” page of the backup wizard. Check the checkbox for “Save backup copy automatically when I close my company file every [ 3 ] times” and change the number of times you close your company file if you prefer to let QuickBooks automatically backup your company every “x” number of times you close your file. 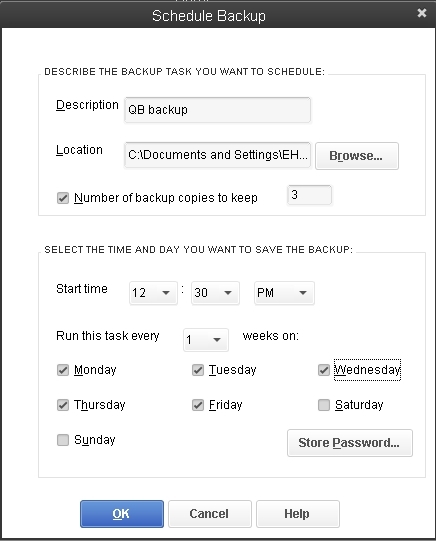 Add a description, set your backup location and set the day and time to backup. Click the “Store Password” button to store your Window password*. Click the “OK” button to complete your schedule backup. *QuickBooks needs your Windows login information so it can run the scheduled backup. If you don’t enter login information for the backup location you selected, the backup fails due to a Windows permission failure. Search Microsoft Help for “Passwords” to learn more about Windows passwords. This entry was posted in Accounting, Canadian version, Intuit QuickBooks 2013, QuickBooks, QuickBooks 2009/10, QuickBooks 2011, QuickBooks 2012, QuickBooks 2012/13, QuickBooks Asia, QuickBooks Australian version and tagged accounting software, Backup, QuickBooks, QuickBooks 2013, QuickBooks Asia, QuickBooks Singapore, Singapore, Small Business Accounting Software, software. Bookmark the permalink.